The limited availability of fossil resources and the strong ecological impact of greenhouse gas emissions point to the necessity to search for alternative approaches for providing building block chemicals. One possibility may be the use of acetogenic bacteria, capable of utilizing synthesis gas (H2, CO2, CO) as sole energy and carbon sources to produce organic acids and alcohols. 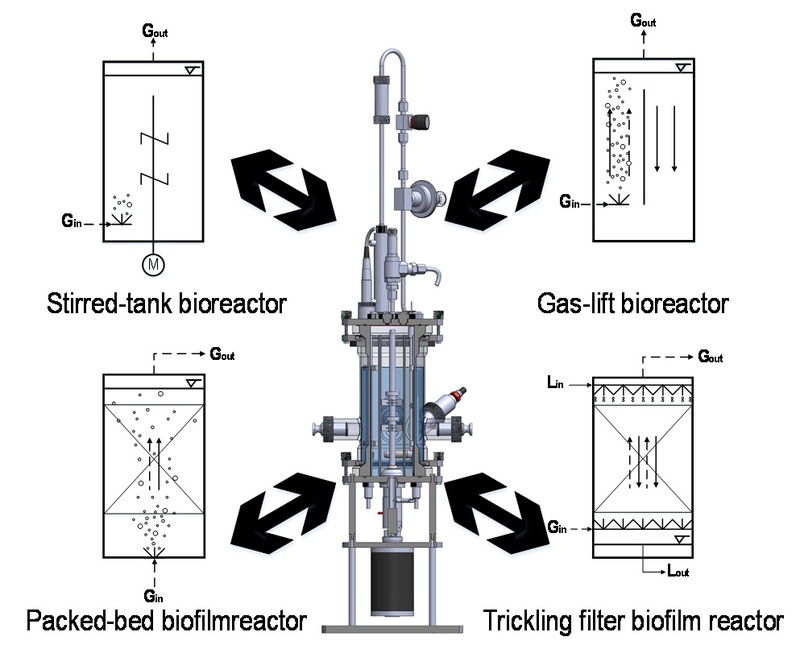 Gas-lift reactors and biofilm reactors are ideally applied for syngas fermentation, but the process performances of new acetogenic strains are usually studied in fully controlled stirred-tank bioreactors with continuous gas supply, because steam sterilizable bench-top bioreactors other than stirred-tanks are hardly available on the market. One possible solution is the uninvasive and reversible conversion of a conventional stirred-tank bioreactor into other bioreactor configurations in form of a multi-purpose bioreactor. This offers the unique opportunity to study the microbial behaviour of acetogenic bacteria under four different reactor environments on a laboratory-scale with minimum effort. The configuration of each bioreactor has a large influence on the efficiency of the microbiological process. The integration of four reactor types in one system provides the flexibility of process adaption depending on the used microorganisms (e.g. Clostridium, Acetobacterium, Eurobacterium, Butyribacterium) and which product is aimed to generate (e.g. alcohol, acids). The bioreactor can be converted into all four reactor configurations within 15 to 20 minutes. The system is equipped with pH sensoring and control, temperature regulation and continuous gas supply. The system can be operated with a pressure up to 3.5 bar in batch, semi-continuous or continuous mode and is adaptable for all kinds of biological applications including aerobic, anaerobic, autotrophic and heterotrophic processes.